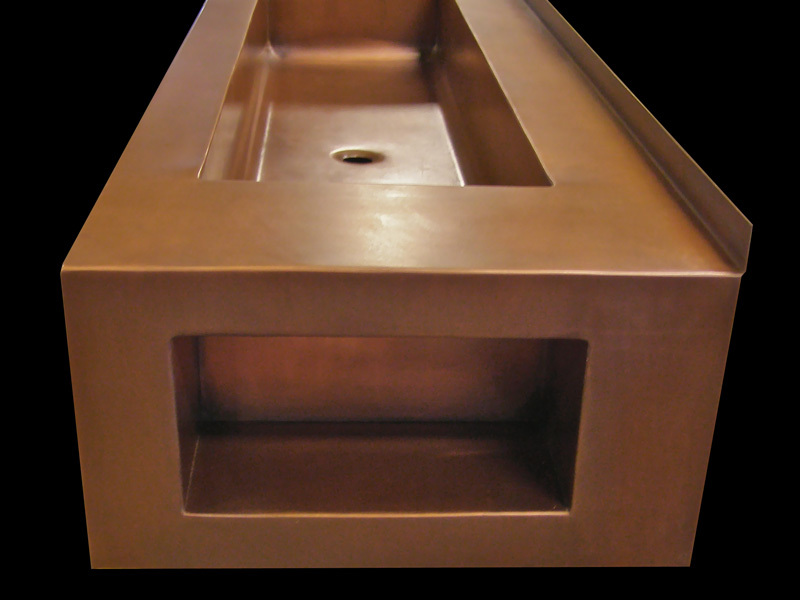 Here at Circle City Copperworks it is easy for us being a custom shop to be able to do about any size or shape of a copper sink that you can imagine. It can be for anywhere that you wish to have a sink. Some examples include a large box sink for a restaurant that is ADA compliant or a free flowing organic sink for your kitchen. Take a look at some of our examples below. Give us a call at 317-284-0687 or a send us a sketch, picture by email or fax at 317-284-0688 and we will be a able to give you a quote and a CAD drawing of what your design will look like. 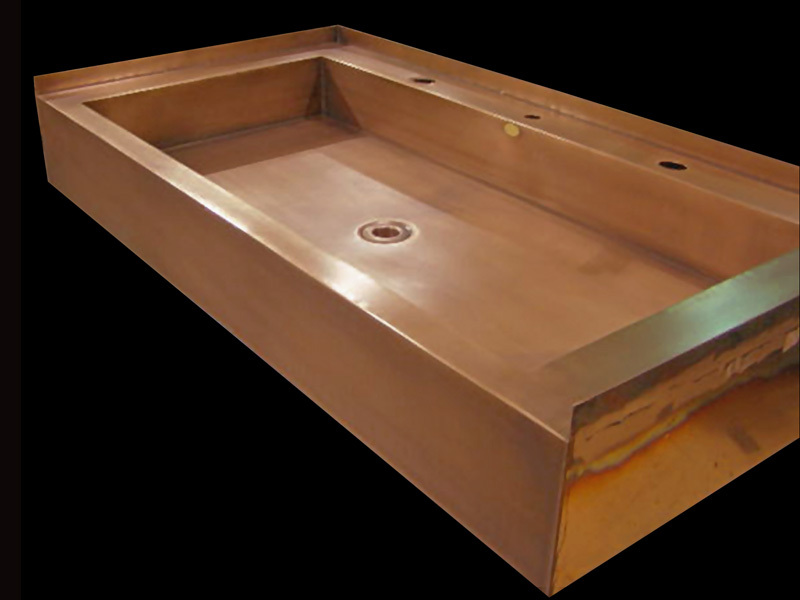 This custom copper sink with drying rack comes in any of Circle City's stunning hammered or smooth finishes. 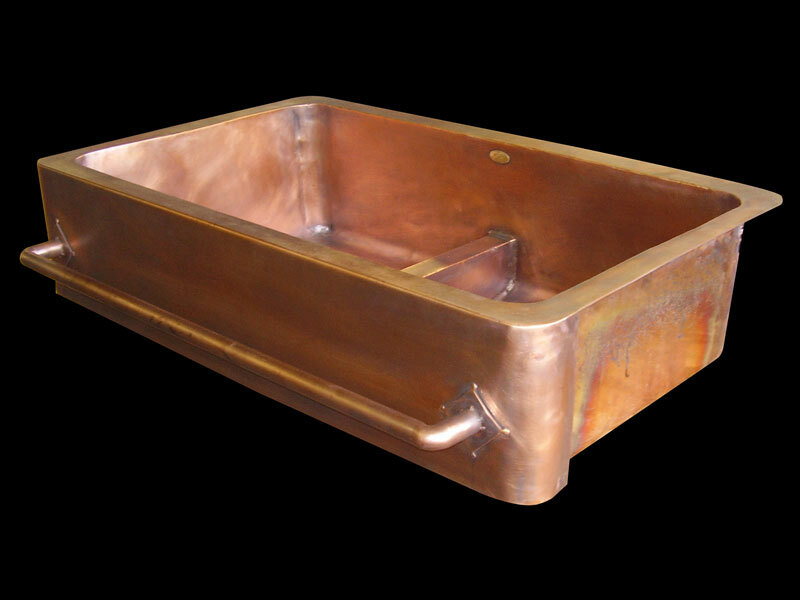 As with any Circle City Copperworks Signature Series copper sink, this sink comes with 1 1/2" radius rounded corners and sides and is handmade in the USA from pure 48 oz. American copper. No lead, tin, or arsenic content is contained, like you will find in unregulated foreign copper products. 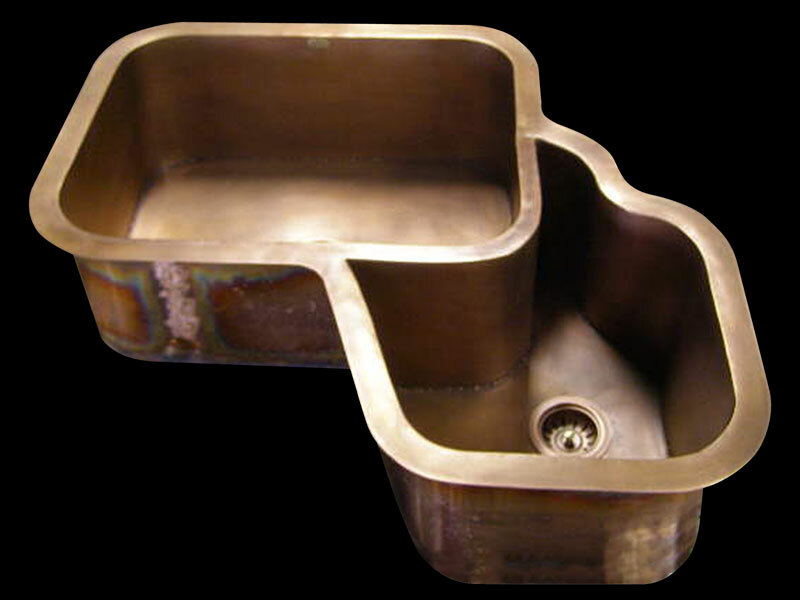 Copper apron front sinks with a 1.5" outer flange and 3.5" drain hole. This Signature Series sink comes in any of Circle City's hammered or smooth finishes, this sink pictured in a light brown. 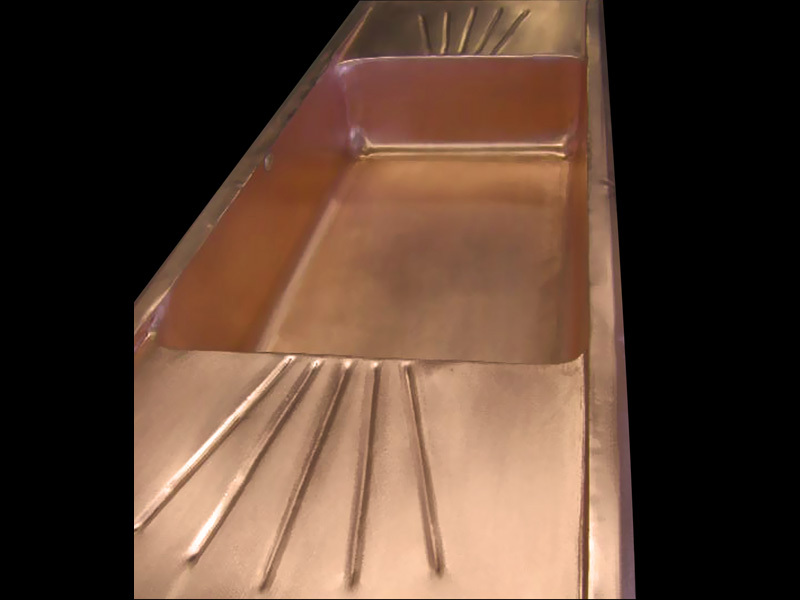 As with any Circle City Copperworks Signature Series copper sink, this apron front copper sink comes with 1 1/2" radius rounded corners and sides and is handmade in the USA from pure 48 oz. American copper. 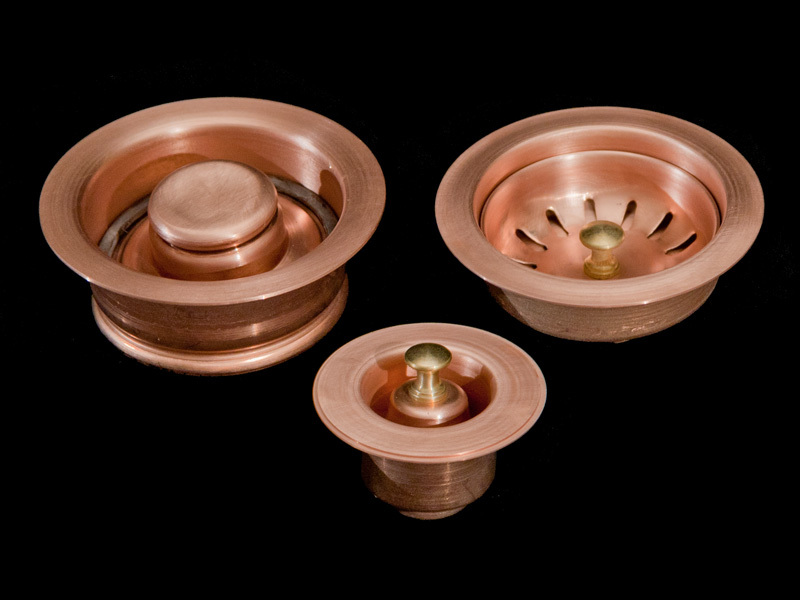 Copper apron front sink with a 1.5" outer flange, towel bar and 3.5" drain holes. The sink comes in any of Circle City's smooth or hammered finished, pictured in a light brown patina. 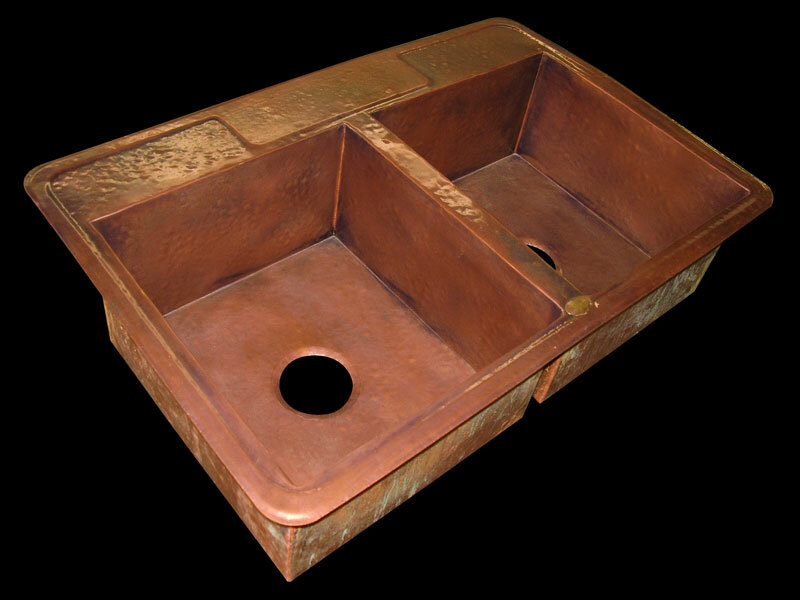 As with any Circle City Copperworks Signature Series copper sink, this apron front copper sink comes with 1 1/2" radius rounded corners and sides and is handmade in the USA from pure 48 oz. American copper. 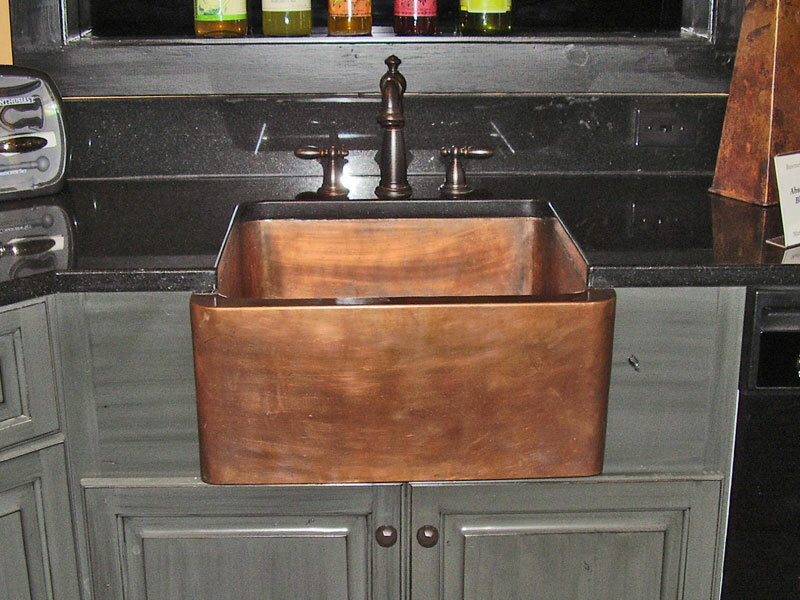 This highly customized copper sink was fabricated for a client in the southwest who wanted something different than the usual copper corner sinks. This sink was hand worked and formed to the shape provided by the client. This sink is actually made from 6 separate pieces of 48 oz. copper. Provide us a design or we can design it for you. Call us at 317-284-0687 to discuss design and custom options. This sink comes in any of Circle City's hammered or smooth finishes. This sink pictured in a medium brown patina, with a 1.5" outer flange and two 3.5" drain holes. This sink comes with squared corners and sides and is handmade in the USA from pure 48 oz. American copper. No lead, tin, or arsenic like you will find in cheaper foreign products. Call us at 317-284-0687 to discuss custom sizing options. Both bowls on this sink measure 15"x15"x7" inside dimensions with a 1.5" outer flange and 3.5" drain holes. It is pictured in a Medium Brown patina. It was made to have the faucet sit right on top of the copper This sink comes with squared corners and sides and is handmade in the USA from pure 48 oz. American copper. For custom sizing or free patinating, please call Circle City Copperworks direct at 317-284-0687. This is a drop-in single bowl Signature Series smooth sink with drying racks on both sides. 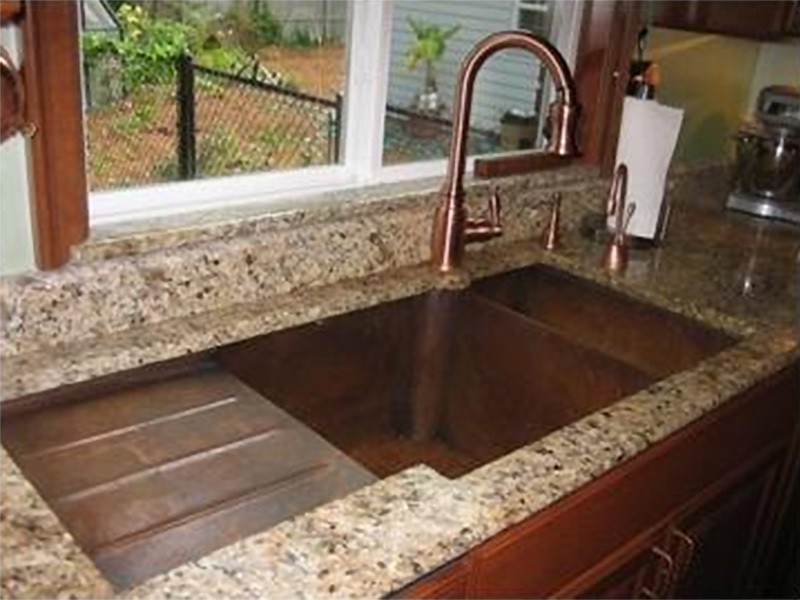 The client for this sink requested a bare copper sink with no patina. If you notice our copper has a real copper tone to it, since it is pure American copper. Any company selling copper that says it is red or the patina will take different depending on the copper sheet, is selling a subpar copper product. This is a custom sink we made for a customer in Aspen, Colorado. They wanted a box style vanity with no cabinet underneath it; it has rounded corners and a flat bottom. We did two this size and one about half the size. It was handmade in the USA from pure 48 oz. American copper. No lead, tin, or arsenic content is contained. For custom sizing or free patinating, please call Circle City Copperworks direct at 317-284-0687. Unlike the sink above, this sink has square corners and sides. We made two of these sinks for the Grange Restaurant in Boise, Idaho. Since they are public restroom sinks, they had to be ADA compliant for all users. It is pictured in a Light Brown patina on smooth copper. American copper. No lead, tin, or arsenic content is contained. Call us at 317-284-0687 to discuss custom sizing options. 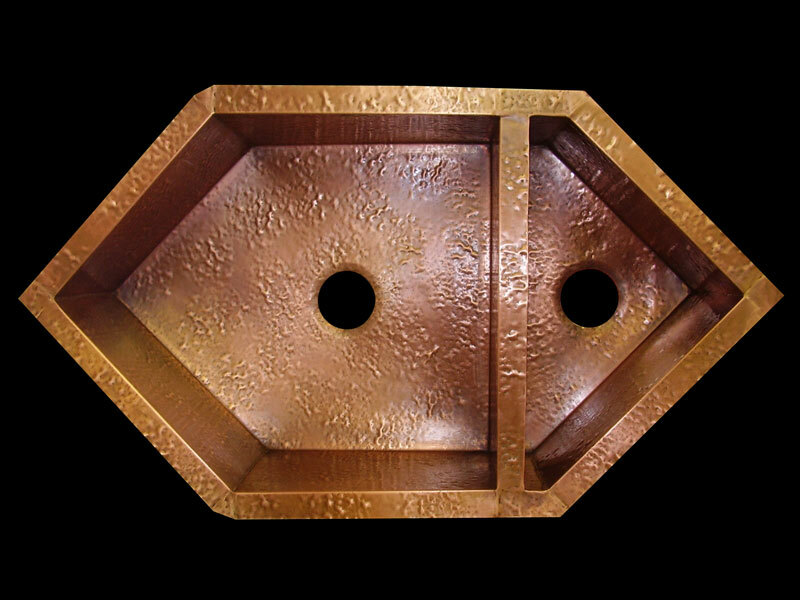 Our drains are solid American copper and made by us. We can color these to match whatever patina you choose for your sink. The one on the left is the disposal drain and will fit Insinkerator® type units with 3 3/8" ID as well as most Kenmore® , KitchenAid®, Maytag® , Jenn Aire® , and select models of Whirlpool®. Will not fit Franke® Waste King, or Whirlaway® models. The right drain is our strainer drain, it comes with a PVC bottom for easy installation, these two drains can be used for prep sinks also. The smaller one in the front and middle is our smaller prep or bathroom sink drain for a 2" opening. Drain price only with purchase of a sink is $150. Everything Circle City Copperworks fabricates is custom and hand-made here in Indianapolis, Indiana from pure American copper. These pictures are provided to give you an idea of what we can fabricate. Design anything you want using these as ideas, or use your own creativity to make a sketch to send to us. We can change our products around using different design elements from any of our products. Call us at 317-284-0687 with your ideas. You can either email or fax us your sketches at 317-284-0688. We will get back to you promptly and will walk you through the whole process of making your design become real.